Later I began to take lessons at a Gayu calligraphy school. This laid a solid foundation not only for her development of the various layers of calligraphy technique and skills but also for the SUMIE technique in calligraphic design. During my student years in London, she volunteered and assisted calligraphy classes for children in Japan and London. Since 2000 I work as a freelance artist and a professional calligrapher in Europe and Japan. 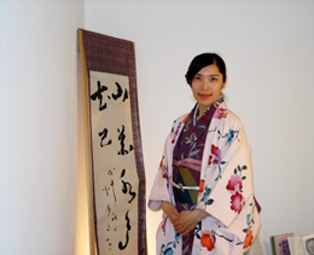 she gives courses and workshops on “SHODO-the art of traditional Japanese calligraphy” in Europe since 2002. Here is the extra info for my profile.